Alliance Française, the Goethe Institute and the Cinenómada Foundation, with the support of the French-German Cultural Fund and the Institut français, invited the directors of Rencontres Internatonales Paris/Berlin as visual art and multimedia experts to be part of the Talentartes 2016 residency programme, and to curate the exhibition of the selected artists within the framework of the Biennial International art expo, SIART. As an extension of this collaboration, the Cinenómada Foundation and its director, Juan Carlos Valdivia, invited the directors of Rencontres Internatonales as associate curators of the cinema section of the Biennial. 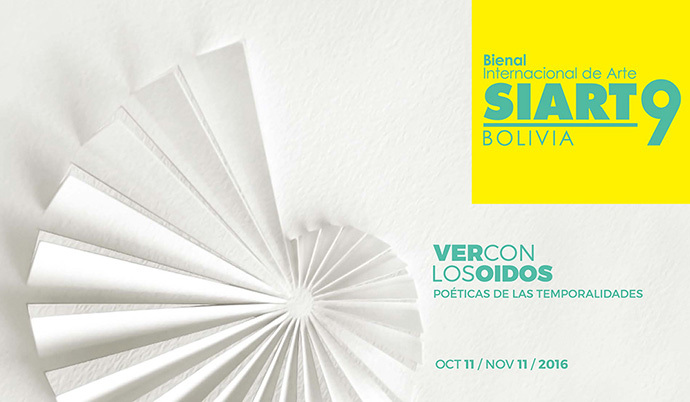 This exhibition gathers works by three young Bolivian artists, Serena Vargas, Nancy Cronen and Eloisa Larrea, chosen by Joaquin Sanchez, the artistic director of the Biennial International Art expo, SIART, and Jean-François Rettig, codirector of Rencontres Internationales Paris/Berlin, following the 2016 Talentartes artist residency held in La Paz in May 2016. Talentartes is a project organized and funded by Alliance Française, the Goethe Institute and the Cinenómada Foundation, with the support of the French-German Cultural Fund and the Institut français. The Cinenómada Foundation and its director Juan Carlos Valdivia invited the directors of Rencontres Internationales Paris/Berlin as associate curators of the cinema section of the Biennial International Art expo, SIART, with the support of Alliance française, the Goethe Institute, the French-German Cultural Fund and the Institut français. The week-long programme was held in the presence of: Thom Andersen, Laurence Bonvin, Claire Denis, Paz Encina, Thomas Heise, Joaquín del Paso, Michele Pennetta, and Teddy Williams. The directors of the Rencontres Internationales Paris/Berlin presented a carte blanche screening programme on October 15 at the Bolivian Cinematheque, within the framework of the cinema section of the Biennial International art expo, SIART.